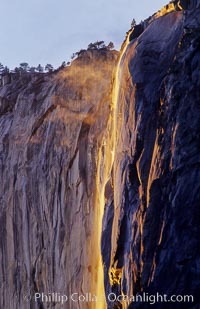 Horsetail Falls is an ephemeral fall cascading down the eastern nose of El Capitan. For a few weeks each February, if Horsetail Falls is flowing and the sky is clear at sunset, the sun's last rays backlight Horsetail Falls producing a magical glow. It lasts for just a few minutes but is worth the trip.